Understanding of risk factors and developing healthy lifestyles is a way of tackling the surging burden of chronic diseases in low-to-middle income countries such as Nepal. Health literacy (HL) has a pivotal role in prevention, adherence to treatment, self-care, and better use of health care; therefore, factors associated with HL need to be studied in the context of Nepal. This study was conducted to assess the level of HL and explore disease-specific knowledge among patients with chronic diseases. A cross-sectional study was conducted among 426 respondents with hypertension, diabetes mellitus, or chronic obstructive pulmonary disease from a tertiary care hospital and primary care clinics using face-to-face interviews. HL was measured using a translated and pretested HL questionnaire (the Europe-Asia Health Literacy Survey Questionnaire). Disease-related knowledge was assessed using a validated questionnaire. The study found that 27% of the respondents had sufficient HL, 19% had marginal HL, and 54% had inadequate HL. Factors associated with inadequate HL included being older and female, and having lower or no education, unemployment or retired status, poverty, and having a history of smoking or a history of consuming alcohol. HL was a strong predictor of knowledge regarding hypertension (β = 0.32; p < .05), diabetes mellitus (β = 0.41; p < .05), and chronic obstructive pulmonary disease (β = 0.37; p < .05) in multiple regression analyses after adjusting for age, gender, education, marriage, family history of disease, attendance at follow-up clinics at recommended intervals, information received regarding disease at clinics, smoking, and alcohol intake. Very little is known about health literacy in Nepal. We conducted a study to learn how much people in Nepal with hypertension, diabetes, or chronic obstructive pulmonary disease knew about their condition and sought to check its association with health literacy. We found that more than one-half of the participants did not have adequate health literacy levels. Participants who were older, female, uneducated, retired from work, or poor had lower levels of health literacy. 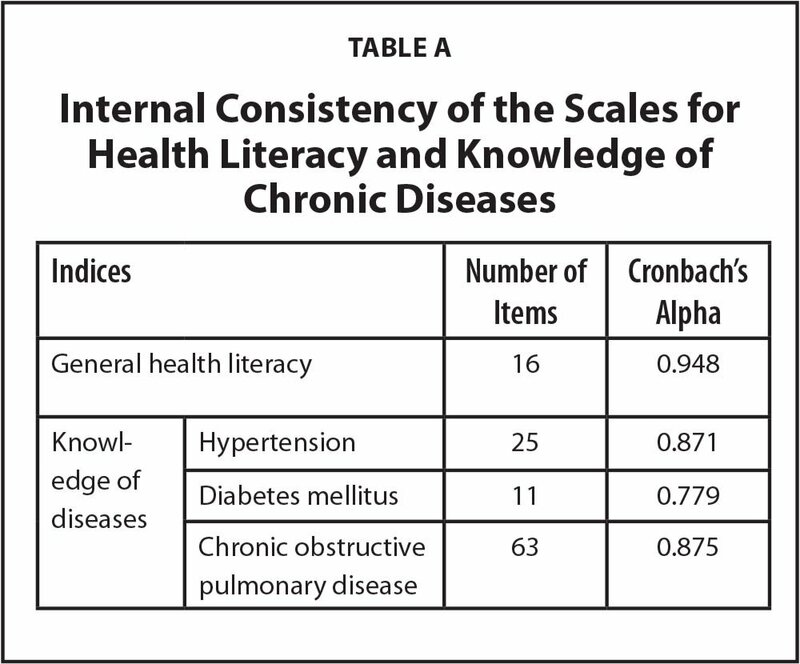 We also found that those with high levels of health literacy had better knowledge of their disease. Therefore, we recommend that in Nepal health literacy should be measured for each patient and support regarding management of his or her condition should be provided if necessary. Modern health care requires that people understand and apply health-related information in clinical settings and in making lifestyle choices (Doyle, Cafferkey, & Fullam, 2012). Noncommunicable diseases (NCD) are the leading causes of death worldwide, with approximately 80% of all NCD-related death occurring in low- and middle-income countries (LMICs) (Alwan, 2011). The most prominent NCDs are cardiovascular disease, cancer, chronic obstructive pulmonary disease (COPD), and diabetes mellitus (DM), which are caused in large measure by lifestyle choices (World Health Organization, 2009). Similar to other LMICs, the country of Nepal is facing the burden of NCDs. 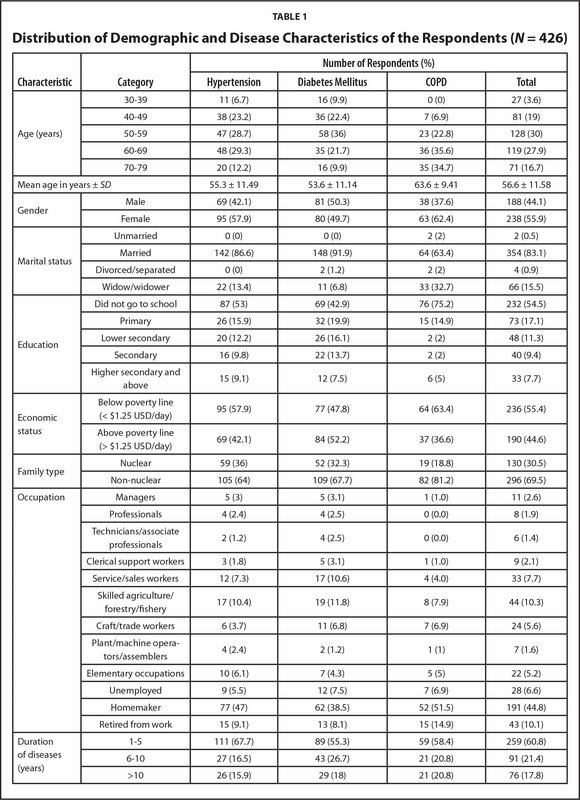 A national survey in 2014 reported that the prevalence of hypertension (HTN) and DM in Nepal were 26.7%, and 3.6%, respectively (Aryal et al., 2015). A hospital-based survey found that COPD was the most common NCD in Nepal, with a prevalence of 43% (Bhandari, Angdembe, Dhimal, Neupane, & Bhusal, 2014). Health literacy (HL) is independently associated with disease-related knowledge (Gazmararian, Williams, Peel, & Baker, 2003). Limited HL hinders patients' ability to access health care, adhere to physician instructions, and stay compliant with medications. In addition, limited HL negatively affects a patient's ability to understand the relationship between health outcomes and lifestyle factors such as diet and exercise (U.S. Department of Health and Human Services, 2014). HL helps improve knowledge and understanding of health determinants and can motivate people to adopt healthy behaviors (Nutbeam, 2000). HL has been increasingly identified as an underlying cause of NCDs (Greenhalgh, 2015; Osborne, Beauchamp, & Batterham, 2016). Only a few studies have examined HL in Nepal. According to a study done in Jhaukhel-Duwakot, Nepal, about 60% of respondents did not know any symptoms of a heart attack and only 20% knew several of the symptoms (Vaidya, Aryal, & Krettek, 2013). Half of all NCDs result from poor lifestyle choices such as drug abuse, harmful alcohol use, tobacco use, poor diet, or lack of physical activity. Unless we target prevention, management, and control of chronic diseases, the prevalence of chronic diseases will keep rising in LMICs like Nepal (Neupane & Kallestrup, 2013). HL plays a pivotal role in prevention, adherence to treatment, self-care, and use of the health care system. Addressing HL is also thought to be a key factor for attaining the United Nations' sustainable development goals in Nepal (Budhathoki et al., 2017). Hence, it is important to study the association of HL in regard to knowledge about NCDs in the Nepalese context. This study aims to measure the level of HL in Nepal and assess its association with chronic diseases among patients in Nepal who have chronic diseases. We performed a cross-sectional study from September 2014 to August 2015 at the B.P. Koirala Institute of Health Science (BPKIHS), Dharan, and at community hospitals at Duhabi-Bhaluwa Municipality in the Sunsari district of Nepal. BPKIHS is a 700-bed hospital where patients from different districts of Eastern Nepal, regardless of their socioeconomic status, come for their treatment (Pokharel, Budhathoki, & Upadhyay, 2016). The community hospital's primary health center at Duhabi-Bhaluwa Municipality is at the center of the Sunsari-Morang Industrial Corridor and serves mostly the poorest segment of the population. The study recruited 426 patients with chronic diseases. Among them, 164 had HTN, 161 had DM, and 101 had COPD They visited the study sites on weekdays during regular appointment hours. We confirmed their disease status by cross-checking their prescription record book. The eligibility criteria were (1) age 30 to 79 years; (2) diagnosed with a chronic disease for at least 1 year and under pharmacological or nonpharmacological therapy; and (3) had visited a study site at least once. In case of comorbidity, we assessed knowledge on the disease with the longest duration or the primary diagnosis. We excluded those who (1) had severe cognitive impairment (not able to correctly identify year, month, district, their age, year of birth, or address); (2) had complications such as renal failure or stroke; and (3) were professional health care workers (as they are expected to have better HL due to their profession). The sample size was calculated based on the prevalence of adequate or sufficient HL (64%) in another similar context (Cutilli & Bennett, 2009). We assumed the prevalence of sufficient HL to be lower than the United States, so 20% was chosen for the sample size calculation. With the permissible error of 20%, and alpha error of 5%, the total estimated sample was 422. Assessment of HL. We assessed HL with a face-to-face interview using a pretested short version of the Europe-Asia-Health Literacy Survey Questionnaire (HLS-EU-ASIA-Q) (Duong et al., 2015; Pelikan, Rothlin, & Ganahl, 2014). The HLS-EU-ASIA-Q is a validated questionnaire that measures three domains of HL: (1) health care, (2) disease prevention, and (3) health promotion (Sørensen et al., 2013). The questionnaire was translated into Nepali and re-checked via translation from Nepali back to English. The questionnaire uses a 4-point Likert scale (1 = very difficult, 2 = fairly difficult, 3 = fairly easy, and 4 = very easy) and included a don't know option. We combined don't know with very difficult. The total HL score ranged from 0 to 16. The mean score of the respondents was used for analyses. In addition, we categorized the score as (1) inadequate (0–8), (2) problematic (9–12), and (3) sufficient (13–16) (Pelikan et al., 2014). Assessment of disease knowledge. We used a validated knowledge questionnaire on HTN (25 questions) and DM (11 questions) (Gazmararian et al., 2003). We used the Bristol COPD knowledge questionnaire (65 questions) to assess the knowledge of COPD (White, Walker, Roberts, Kalisky, & White, 2006). We removed two questions from the COPD questionnaire after reliability testing, which increased the Cronbach's alpha value to 0.948 (Table A). The knowledge questionnaires were translated into Nepali, which was checked with translation back to English. The response format of the test item to measure knowledge was “yes”, “no” or “don't know.” The “don't know” and “no” options were joined for analyses. We interviewed participants using a questionnaire to collect data on socioeconomic and demographic profile (eg, age, gender, type of family, religion, education, occupation, marital status, and family income) (Ministry of Health and Population Nepal, New ERA, 2012), lifestyle factors (personal habits, smoking, tobacco chewing, and alcohol intake), and disease characteristics (duration of illness, family history of disease, attendance at the follow-up clinics at recommended intervals), number of visits, last visit to the clinic, and education on disease and its self-management received during the visit. The data were entered, cleaned by removing invalid entries and discrepancies, and coded using numerical values instead of alphabets for analysis in Microsoft Excel and analyzed using Statistical Package for Social Sciences, version 11.5. The study population was described using frequency, percentage, and mean, and standard deviation as appropriate. We conducted univariate analysis to test the association of knowledge score with age, gender, marital status, education, economic status, occupation, family type, duration of the disease, family history, number of visits, and personal habits for all three chronic diseases (ie, HTN, DM, COPD) using the independent t-test or analysis of variance test as appropriate. We assessed the association between knowledge score and HL score using the Spearman's correlation coefficient. Further, we conducted multivariate linear regression analyses to identify significant predictors of disease-specific knowledge scores. The multivariate model included those variables that were statistically significantly associated at p < .20 in univariate analysis. All the tests results were considered significant at p value < .05. Written informed consent was obtained after informing potential participants about the nature, aim, and objective of the study. Each participant was guaranteed the right to withdraw from the study at any time and that their usual care would not be affected by participating or not participating in the study. In the case of potential participants who were unable to read, the informed consent was conducted with a witness. Ethical clearance was obtained from Institute Review Committee at BPKIHS prior to the study. We enrolled 426 patients with HTN (n = 164, 38%), DM (n = 161, 38%), and COPD (n = 101, 24%) attending the outpatient department from one primary and multiple tertiary care centers. Mean age of the patients with HTN and DM was 53 years, whereas patients with COPD were comparatively older (mean age, 64 years) (Table 1). Most of respondents were women (56%). The majority of the respondents were Hindu (70%), and their occupations were homemaker (45%), agriculture (10%), and retired from work (10%). More than one-half of the participants were unable to read (55%). The median duration of disease was 4 years (interquartile range, 2–10). Responses to the HLS-EU-ASIA-Q revealed that 54% of the participants in this study had inadequate HL, 19% had problematic HL, and 27% had sufficient HL. The level of inadequate HL was highest among patients with COPD (77.2%) (Figure 1). Distribution of levels of health literacy according to disease type (N = 426). 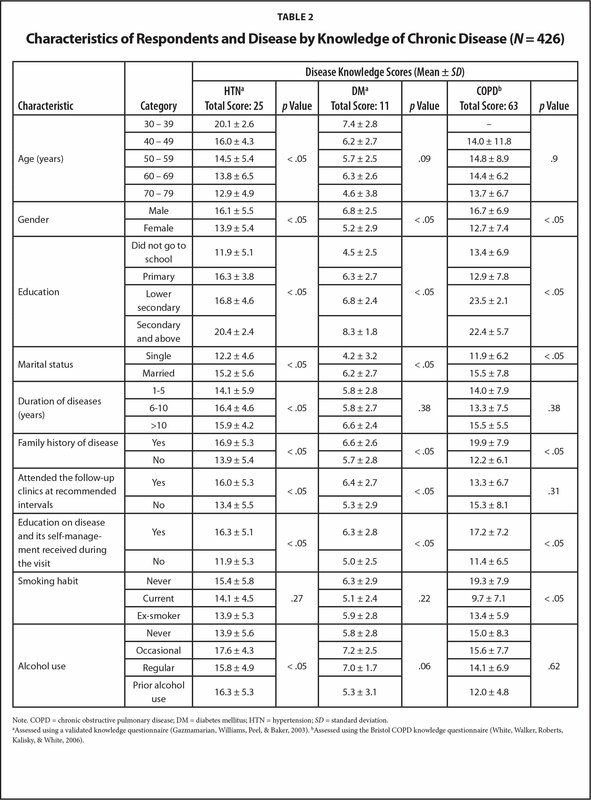 The association between knowledge of the three diseases and participant characteristics is presented in Table 2. Men and those with a higher level of education scored higher for knowledge about all three diseases (p < .05). Disease duration was not statistically associated with the knowledge score for any of the three chronic diseases. 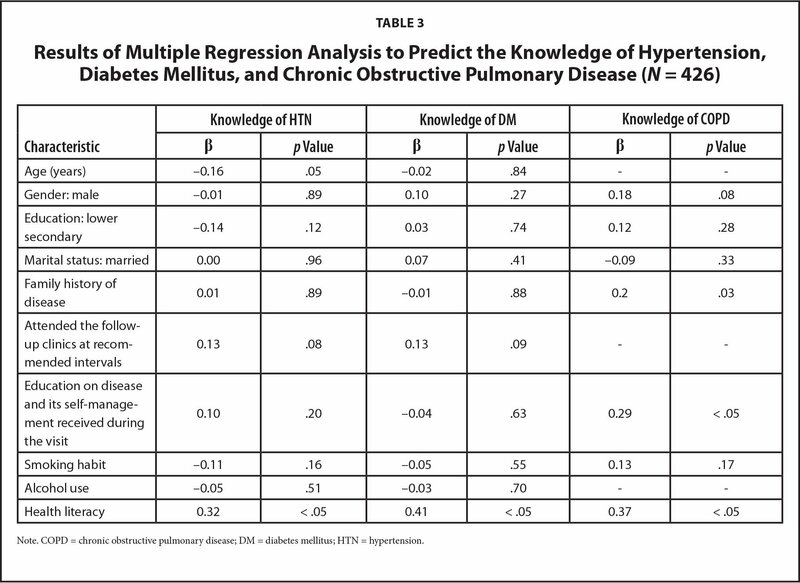 Among patients with HTN and COPD, a significantly higher mean knowledge score was observed with respondents having a family history of the same diseases. Patients with HTN and DM who attended the follow-up clinics at recommended intervals had significantly higher knowledge score than those who did not attend the follow-up clinics at recommended intervals (p < .05 for HTN; p < .05 for DM). HL was the strongest associated variable (Table 3) of knowledge for patients with HTN (β = 0.32; p < .05) and DM (β = 0.41, p < .05) after adjusting for age, gender, higher education, marital status, family history of disease, attendance at the follow-up clinics at recommended intervals, education on disease and its self-management received during the visit, smoking habit, and alcohol use. For COPD knowledge, HL (β = 0.37; p < .05), education on disease and its self-management received during the visit (β = 0.29; p < .05) and family history (β = 0.2; p < .05) were significantly associated with knowledge score after adjusting for gender, education, marriage, and smoking (Table 3). 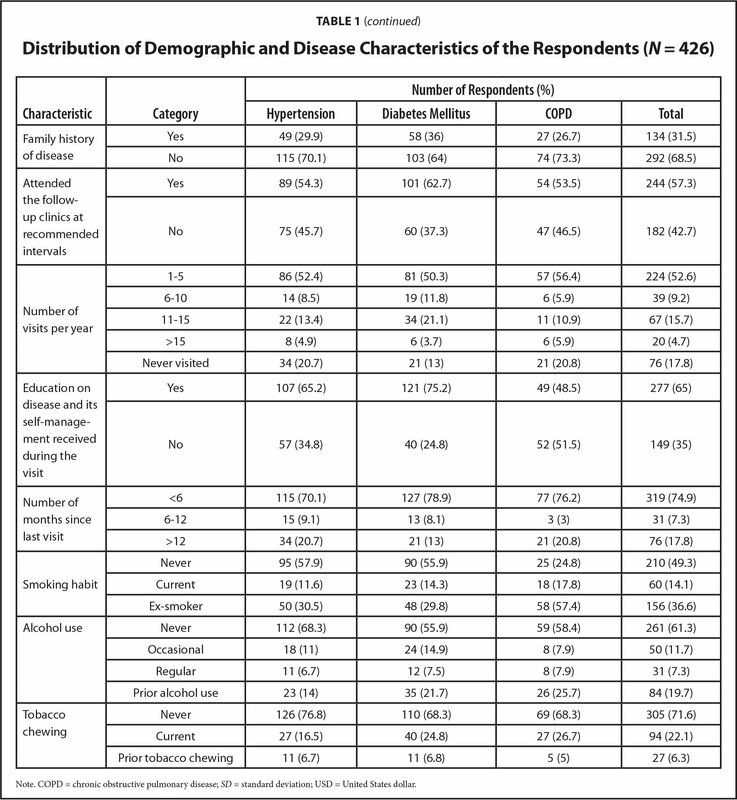 This cross-sectional study aimed to provide initial insight on the association of HL with knowledge of chronic diseases among patients in eastern Nepal. Inadequate and problematic HL was high in our study, comprising 73% of this cohort, and HL was strongly associated with knowledge of chronic disease. Only 27% of the participants had sufficient HL, which is lower than the 52% found in a European study (HLS-EU Consortium, 2012). Similarly, an Internet-based study done in Japan (Nakayama et al., 2015) found that inadequate and problematic HL was 85.4%, which is higher than our study. Similarly, low HL was found in 77% of a cohort in Karnataka, India (Rathnakar et al., 2013). This is different from a much older study done in the United States (Williams et al., 1995), in which 22.% and 61.7% of patients had inadequate or marginal functional HL. In the same study, older patients had higher inadequate HL than younger patients, which is similar to what occurred in our study. In a Portuguese study, knowledge scores were high among people with high socio-economic status, more schooling, and intermediate age (Borges, Rombaldi, Knuth, & Hallal, 2009). This is similar to our bivariate analysis finding: knowledge was higher among the group age 30 to 50 years and decreased among the older age group. In an Iranian study (Veghari et al., 2012), education levels were not significantly associated with the awareness of HTN, and people who did not go to school were more aware of the disease. On the contrary, the levels of education from the bivariate analysis in our study were positively related to disease knowledge for each disease type. Our findings are similar to an Indian study that reported a positive association of higher education and presence of family history of DM with diabetes knowledge (Mathew et al., 2014). People with higher levels of HL often search for required health information, leading to better knowledge compared to people who are unable to read. But, people who are unable to read may be more likely to get information from other sources such as their primary health network or the radio (World Health Organization, Regional Office for South-East Asia, 2009). Multiple studies report that disease duration influences knowledge and attitudes of patients with type 2 DM (Bains & Egede, 2011; Rodrigues, dos Santos, Teixeira, Gonela, & Zanetti, 2011). However, our study did not show significant associations between the duration of the disease and knowledge of DM, HTN, or COPD. In Nepal, family members typically take care of patients with chronic diseases, which might limit access to information. In a study from China, family history of chronic disease was one of the predictors of higher knowledge (Song et al., 2013). Our study found similar associations between having a family history of disease and knowledge in bivariate analyses for HTN and COPD; however, in multivariable analyses, this finding was significant exclusively for patients with COPD. Bivariate analysis showed that current smokers and ex-smokers had lower knowledge of COPD. In contrast to our finding, prior reports reveal better knowledge of COPD among smokers and ex-smokers compared to nonsmokers (Miravitlles et al., 2006). A study done in Botswana reported a significant relationship between alcohol intake and knowledge of HTN, in which nondrinkers had higher knowledge scores compared to those who did drink alcohol (Zungu & Djumbe, 2013). Although it was significant in the bivariate analysis, multivariate analysis did not show a significant association between drinking and knowledge score in our study. In our study, HL was significantly associated with knowledge about HTN, which is consistent with the findings of prior work (Williams, Baker, Parker, & Nurss, 1998). HL was significantly positively associated with knowledge about DM (Bains & Egede, 2011) after adjusting for medication adherence and self-care. Similarly, in our study, higher HL is associated with knowledge of DM after adjusting for other variables. Our study also found that HL was strongly associated with the knowledge about COPD, information received at the clinic, and family history. This is consistent with a prior study that reported patients with low HL were less likely to believe that they will always have COPD after adjusting for sociodemographic factors and other health beliefs (Kale et al., 2015). This study is the first (to our knowledge) in Nepal to measure the prevalence of HL and its association with knowledge of chronic diseases. We conducted the study in primary as well as tertiary centers with participants from varied socioeconomic strata. The study demonstrated a positive relationship between HL and knowledge of chronic diseases. Our study, however, has several limitations. First, we recruited the participants using convenience sampling from two sites in the eastern part of Nepal, so the result may not be generalizable to the entire population. Second, because this is a cross-sectional study, causation cannot be established. Third, when patients had multiple diseases we chose to assess knowledge for the disease they had had for the longest duration; however, patients with multiple chronic conditions might have more contacts with the health system, leading to higher knowledge. Fourth, clinician characteristics and the length of clinician encounters were not incorporated into the current study. Limited HL was common among patients with HTN, DM, and COPD in our Nepali-speaking cohort. Higher HL was associated with knowledge of chronic disease; therefore, a strategy to educate chronic disease patients is necessary. Future research is needed to focus on mechanisms to improve HL, improve disease knowledge, and potentially improve health outcomes. Neupane, D. & Kallestrup, P. (2013). Non-communicable diseases in Nepal: Challenges and opportunities. Journal of Nepal Health Research Council, 11(2), 225–228. Pelikan, J. M. ( 2014, November 4. ). Measuring comprehensive health literacy in general populations: Validation of instrument, indices and scales of the HLS-EU study. Oral presentation at the 6th Annual Health Literacy Research Conference. . Bethesda, MD. .
Pokharel, P. K., Budhathoki, S. S. & Upadhyay, M. P. (2016). Teaching district concept of BP Koirala Institute of Health Sciences: An inter-disciplinary community based medical education and health service delivery model in rural Nepal. Kathmandu University Medical Journal, 55(3), 294–298. Zungu, L. I. & Djumbe, F. (2013). Knowledge and lifestyle practices of hypertensive patients attending a primary health care clinic in Botswana. African Journal for Physical, Health Education, Recreation and Dance, (Suppl. 1), S123–S138. Abha Shrestha, MD, is the Registrar and the Quality Rural Health Service Program Lead, Department of Community Programs, Dhulikhel Hospital Kathmandu University Hospital. Suman Bahadur Singh, MD, is an Additional Professor, School of Public Health and Community Medicine, B.P. Koirala Institute of Health Sciences (BPKIHS). Vijay Kumar Khanal, MD, is an Associate Professor, School of Public Health and Community Medicine, BPKIHS. Sailesh Bhattarai, MA, is an Assistant Professor, School of Public Health and Community Medicine, BPKIHS. Robin Maskey, MD, is an Additional Professor, Department of Internal Medicine, BPKIHS. Paras Kumar Pokharel, MD, is a Professor, School of Public Health and Community Medicine, BPKIHS. Address correspondence to Paras Kumar Pokharel, MD, School of Public Health and Community Medicine, B.P Koirala Institute of Health Sciences, Ghopa-18, Dharan, 56700, Province 1, Nepal; email: paras.pokharel@bpkihs.edu. Acknowledgments: The authors thank the participants in this study, the BPKIHS, and all who helped during the course of this study. They also thank Dr. Shyam Sundar Budhathoki (BPKIHS) and Dr. Archana Shrestha (Harvard University) for their help in revising the manuscript. © 2018 Shrestha, Singh, Khanal, et al. ; licensee SLACK Incorporated.